Someone turned the dial to Spring this week. 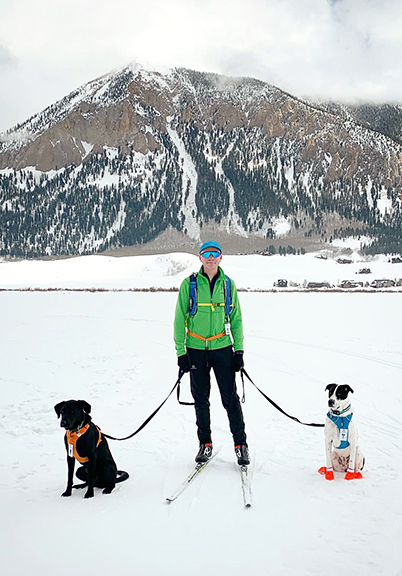 In winter, we used to wait for the temperatures to warm up before we could hit the Nordic trails. Now, we have to go as early as possible before the temperatures get too warm and the snow turns to slush. 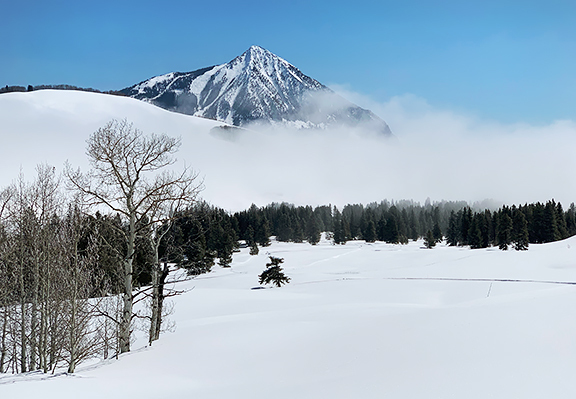 It smells like spring outside in the mountains – like melted snow and warmth and a barely perceptible hint of damp wood. Coyote tracks in the snow don’t get blown away or covered up so much as amplified by the sun’s rays. And Yuki gets her dog stink on after a few minutes on the deck. It’s lovely. All of it. 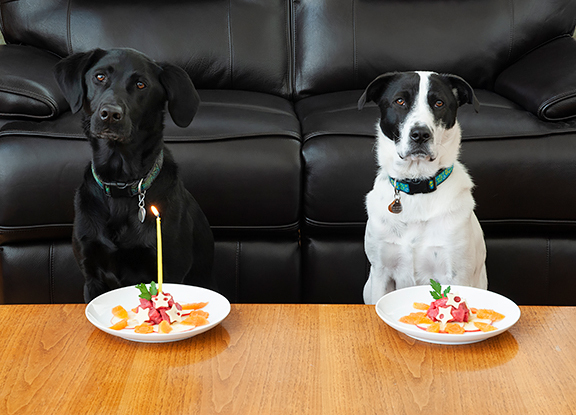 Wednesday was Neva’s fourth birthday and we had a little party for her with Yuki in attendance. We are settling into a nice routine with the pups and I think we have Neva to thank for making Free Range Yuki a reality. When we used to leave the house, Yuki would be nervous and would not play with her toys. She remained at Neva’s side until we returned. But Neva is very chill and good when we are not home. She mostly takes naps, sometimes looks out the window, and occasionally barks her head off at the UPS or FedEx trucks. She let Yuki know that everything was okay. Now, Yuki naps, checks the perimeter (she is many breeds of guard dogs), looks out the window, plays a little with Neva, and even grabs a toy for a few minutes. 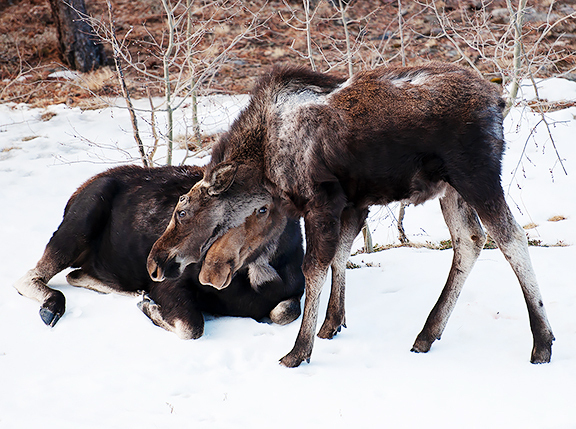 As if on cue, our local mama moose and her yearling (you can see his antler nubs coming in) came by one morning to nibble away at the aspens and currant bushes like she does with each calf every spring. 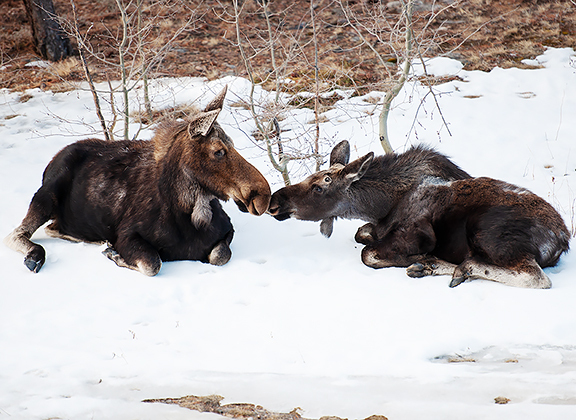 They hung out for a couple of hours in our and our neighbors’ yards. Everyone kept their dogs inside for as long as possible to avoid disturbing the pair until they wandered off to another part of the neighborhood. I managed a few photos from the safety of our deck. Such magnificent creatures. 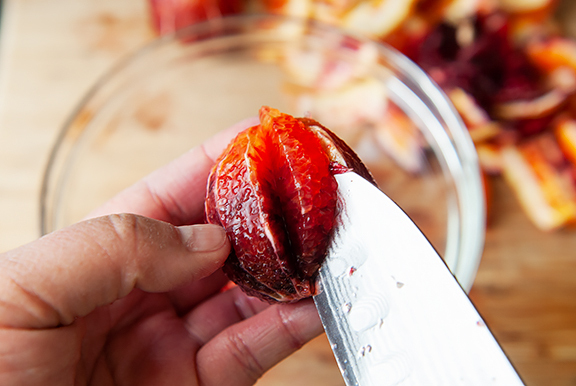 Today’s recipe is good for spring, summer, fall, winter, because you top it with any seasonal fruit you like. I was looking for a reliable gluten-free cake since most of my gluten-free dessert repertoire consists of non-cake items. The problem with gluten-free baking is that I’m also dealing with high altitude baking. I spent two months working through some version and variation of this cake – sending moderate successes to my neighbors and trashing a couple of outright disasters. But I figured out the tweaks and now have a winner. This cake is baked in an 8-inch springform pan, so smaller than your standard 9-inch cake. The original recipe calls for buttering the pan (or use melted coconut oil), but I line the bottom with parchment paper first and then butter the pan. I’ve become a huge fan of parchment paper for ease of release because I’ve had too many disappointing releases without parchment. I also suspect you could bake this in a standard round baking pan, but I haven’t actually tried it yet. Mix the almond flour, coconut flour, baking powder, and salt together. If you don’t have coconut flour, substitute 1/4 cup of almond flour for the tablespoon of coconut flour. I had never baked with coconut flour before, but I liked the results as the cake was more stable than an all almond flour recipe I tried earlier. Part of the secret to the success of this cake is the whipped egg whites. Yes, there is leavening in the form of baking powder, but the whites really lend good volume to the cake. For high altitude baking, I reduced the amount of leavening until my cake rose just enough and held its shape during the bake. 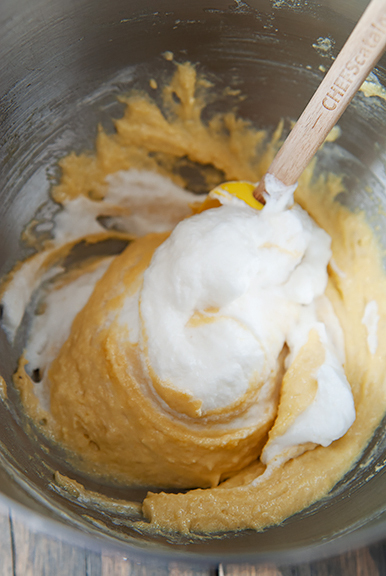 When you incorporate the whipped whites into the very thick egg yolk mixture, you need to introduce a little at a time to gradually lighten the batter. This is called tempering the batter. 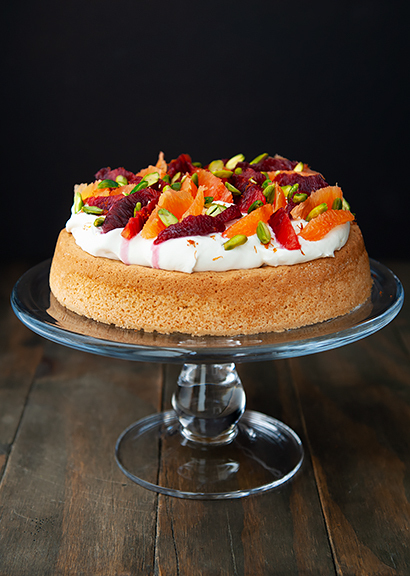 If you add it all at once, you will deflate too much of the air bubbles in your meringue, resulting in a flat cake. 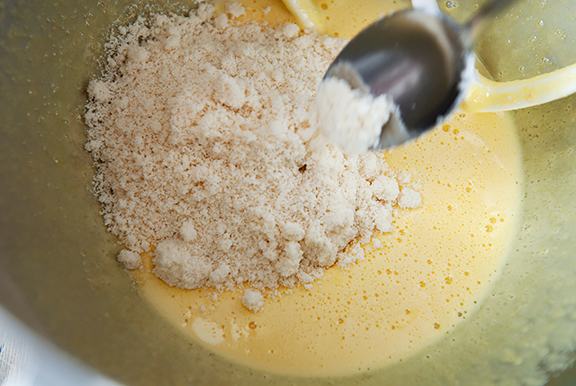 So fold in a half cup at a time until you have a smooth and fluffy batter. While your cake bakes, prepare the whipped cream and your toppings. 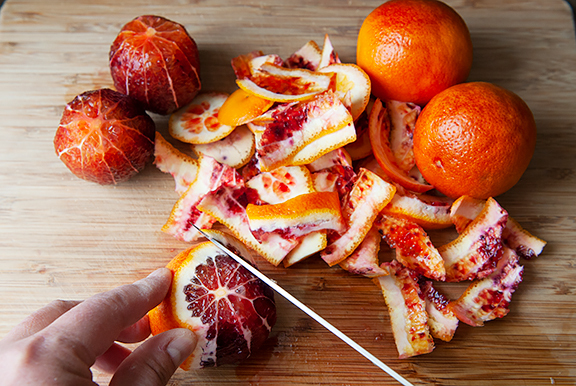 Because blood oranges are still in stores, I couldn’t help incorporating them into this dessert. But you can use strawberries, raspberries, blueberries, cherries, mangoes, kiwi, passion fruit, persimmons, pomegranates, chocolate, candied nuts, cocoa nibs, sprinkles, whatever you like. I keep my whipped cream light on the sugar if the cake itself is sweet enough, but I always add a little vanilla and almond extract for more flavor. You can test your cake for doneness with a toothpick, but I discovered the hard way that poking a hole in the center of my cake resulted in a fallen cake. I baked enough of these cakes to read the doneness by color. The original recipe says a 30 to 35 minute bake, but I found 45 minutes worked best for me. The cake was golden in color and the center sprang back when I pushed it lightly with my finger. 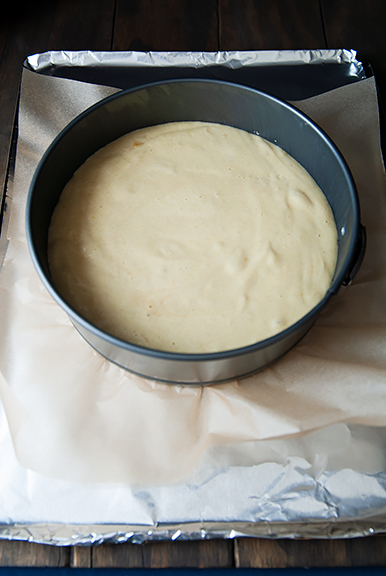 When it is ready, remove the cake from the oven and let it cool in the pan for 5 minutes. It will shrink from the sides and settle a bit, but when baked through, it shouldn’t crater in the center. Run a knife along the sides to ensure a clean release and remove the sides of the springform pan. When the cake is completely cooled, garnish with whipped cream and your toppings. One of my biggest gripes with all of the blog posts on gluten-free almond cakes was how they never showed you an actual slice of the cake. It was maddening. How on earth were you supposed to see the crumb? Or were they hiding something like a gooey mess inside? Because I baked A LOT of gluten-free almond cakes that looked perfect on the outside and the interiors were sticky, wet messes. Certainly nothing I could serve guests. I now have serious trust issues with some of the food blogs out there. But King Arthur Flour recipes tend to be consistently reliable and this one is a big winner in my book. The recipe below is for sea level, but I have the adjustment for my elevation (8500 feet) in parentheses. If you are at an elevation between 0 and 8500 feet, I would extrapolate the amount of baking powder. If you are at or above 10,000 feet, you can probably omit the baking powder. 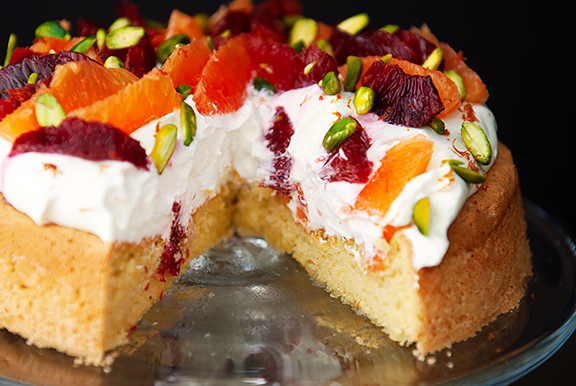 This cake looks and tastes fancy, but it’s pretty straightforward to make. The crumb is a tad on the dense side as cakes go, but it’s wonderfully moist and tender. Here is one instance where the sum of the parts is greater than the whole. 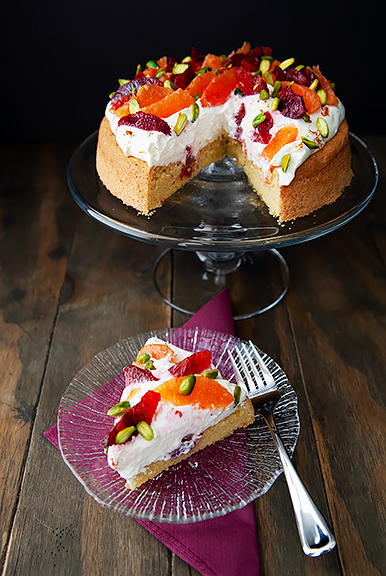 The combination of nutty, creamy, fruity flavors makes this a perfect dessert for any season. Position your baking rack in the center of the oven and preheat to 350°F. 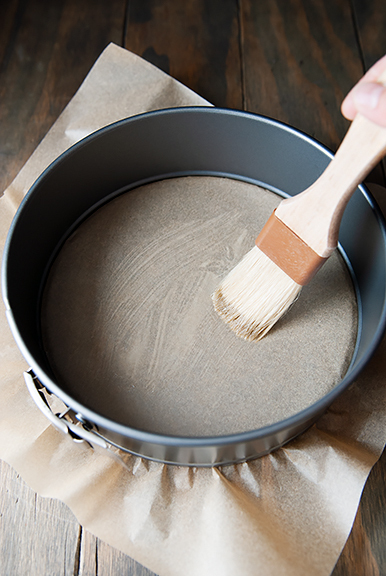 Line an 8-inch springform pan with parchment paper. My lazy way to do this is to lay a square of parchment over the detached base, set the ring around the base then close the ring on the base with the parchment paper corners sticking out on the outside of the pan. Alternatively, you can assemble your springform pan, grease the bottom and lay a circular 8-inch sheet of parchment down on the base. Brush melted butter or coconut oil over the base and up the sides of the pan. 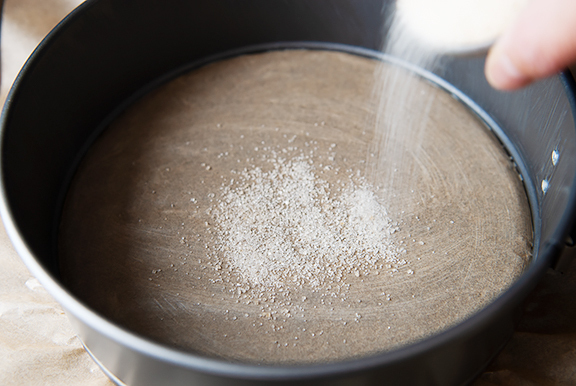 Sprinkle 2 tablespoons of sugar on the bottom of the pan. 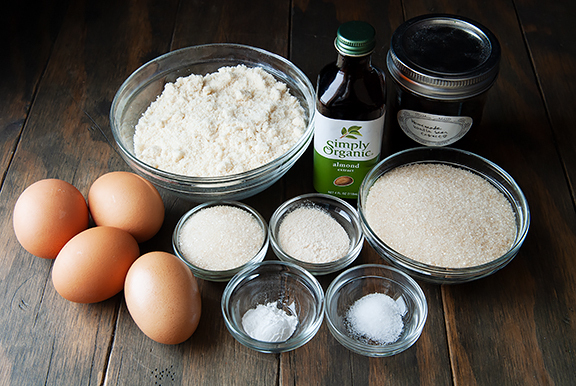 Make the cake: Beat the egg yolks, 1/4 cup sugar, vanilla extract, and almond extract together until smooth and slightly lighter in color. 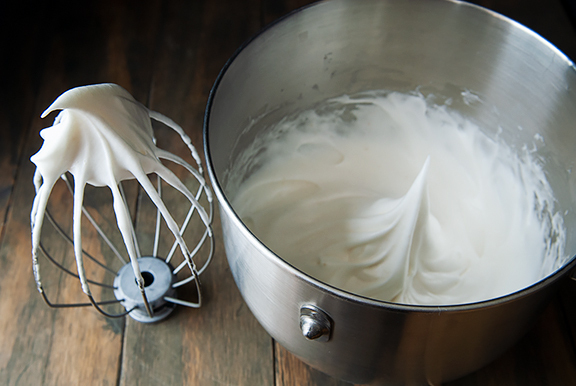 In a separate bowl, whip the egg whites to soft peaks. Slowly beat in the remaining 1/4 cup of sugar until the whites are at medium peaks and a little shiny/glossy. 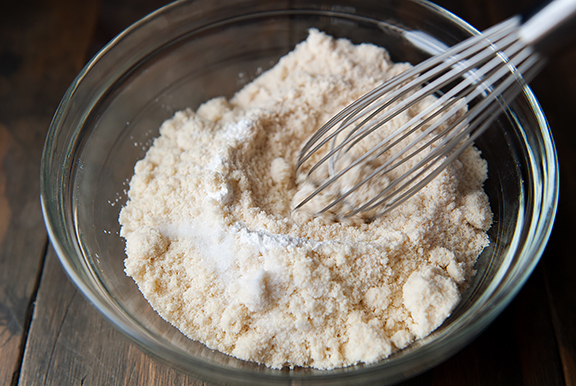 In another bowl, whisk the almond flour, coconut flour, baking powder, and salt together. 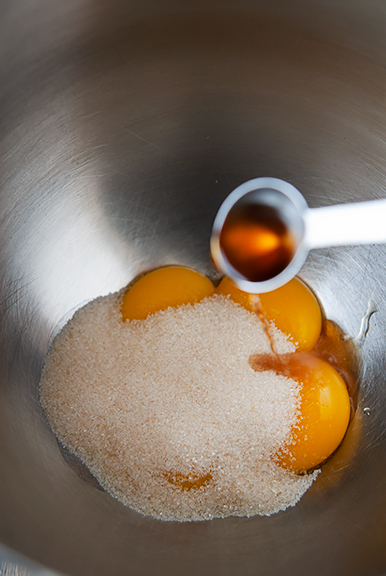 Stir the dry ingredients into the egg yolk mixture. This will result in a very thick batter. Take 1/2 cup of the whipped egg whites and fold them into the egg yolk mixture until fully incorporated. Repeat with another 1/2 cup of the whipped egg whites. This gradually lightens the batter without completely deflating all of the air bubbles in the egg whites, which are important for the structure of the cake. 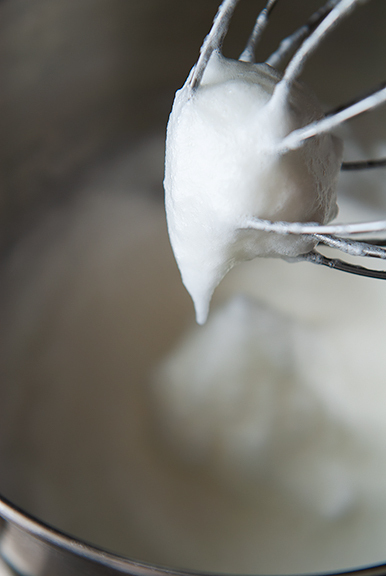 Fold in the rest of the egg whites 1/2 cup at a time, taking care not to stir too hard and deflate the bubbles. 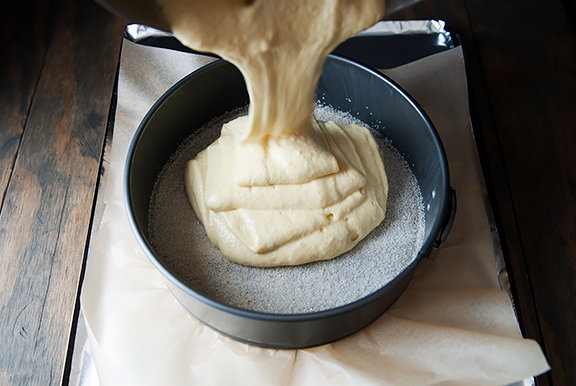 The batter should be smooth and fluffy. Pour the batter into the pan and smooth the top. Bake 30-35 minutes (mine took 45 minutes) until the top is golden brown. The recipe suggests the toothpick test for doneness, but that deflated my cake! I found tapping the top until it no longer jiggled helped. Remove from oven and let the cake cool in the pan for 5 minutes. 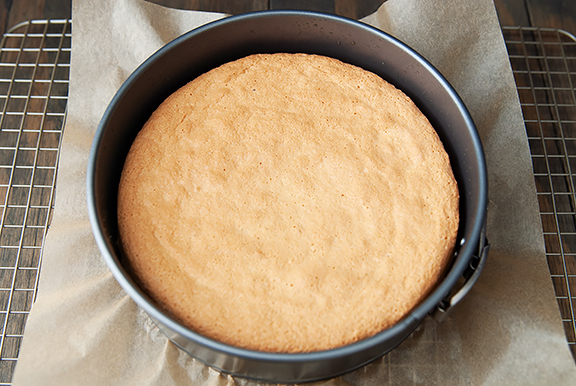 Use a knife around the edges to release the sides from the pan, then turn the cake out. 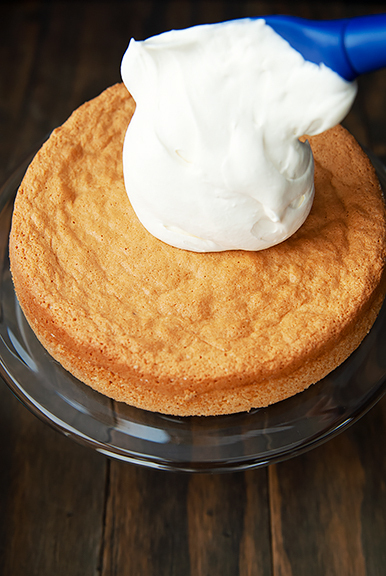 Make the whipped cream and garnish the cake: Beat the whipping cream, sugar, vanilla extract, and almond extract together to medium peaks. 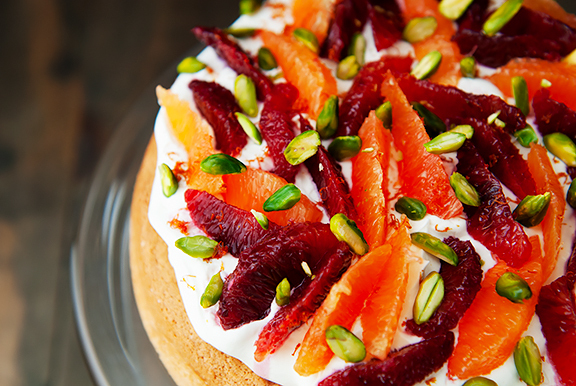 When the cake is completely cooled, top with whipped cream, orange segments, and pistachios. Sprinkle some orange zest on top if you like. Serves 6. What a joy your posts are, Jen! Snuzzling moose, gorgeous mountains, absolutely stunning cake and the most elegant doggie birthday party ever! THANK YOU for sharing your artful life with such panache! It’s especially uplifting on this gray drizzly morn. I so hope our new rescue Boxer will learn to chill from our Doberman, like Yuki did with Neva. 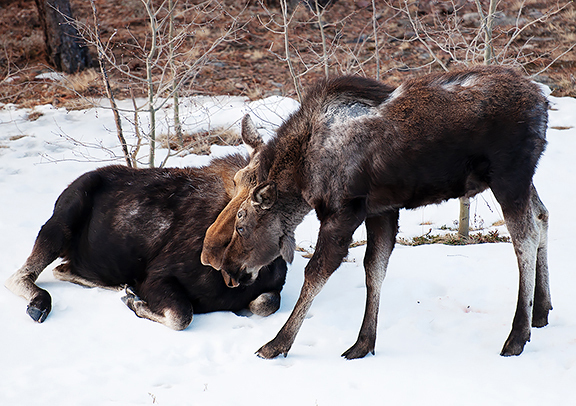 I love your blog and am so jealous that you got to see a moose up close and personal! I so enjoy your photos. The cake looks and sounds delicious, will definitely have to give it a try soon. I want cake!..that cake looks truly scrumptious. Happy spring, Jen! And happy birthday to sweet baby Neva! 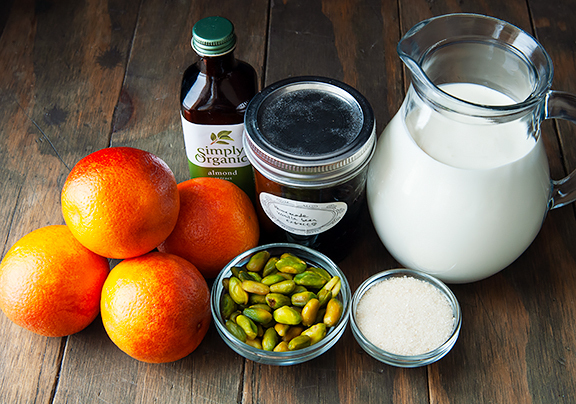 This post did something I haven’t felt in awhile, given how oversaturated we all are with food images/ideas from the web: it made me think like a person possessed: I MUST make this cake SOON. It’s SO gorgeous and is exactly the kind of cake I like to make and eat. Thank you for posting this! Happy happy birthday to Neva!! Out of curiosity, do you remember when you were able to solidly leave her out of her crate when you weren’t home? I’ve got a 6-month-old puppy on my hands, and as someone who works from home (but needs to get the hell out of the house sometimes), I am SO looking forward to when my dog can just chill at home without me being afraid of too-long crate times. The thought of being able to leave him out to roam just sounds like a mirage of a dream that I’ll never get to achieve, haha. Glenda – Hope you like the cake, it’s such a simple cake, yet incredibly festive and delicious! hungry dog – I am so happy to hear that! It sounded boring to me at first, but after meeting with success (finally) and putting it all together, it was incredibly satisfying considering how easy it was to make. I hope it meets your expectations. Allie – It took us up until she was about a year old. We gradually introduced her to it. 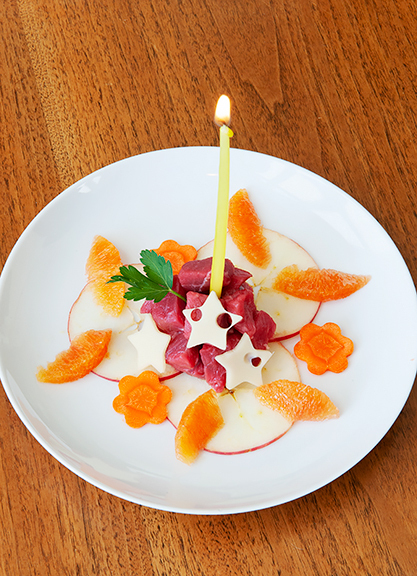 For Yuki, it was similar (and fresher in my memory). When we crated Yuki and Neva was free range, it made Yuki crazy and she would chew and eat her bedding or the cushion. Eventually we started leaving Yuki and Neva for 30 minutes at a time, while we sat in the driveway and watched them on video cam. After a couple of successful trials, we increased the time to 1 hour, 90 minutes, 2 hours while we were at a nearby coffee shop or library. Then 3-4 hours. Now they are pretty good up to 8 hours *if* they had exercise the day before. If they didn’t exercise the day before, Yuki starts to get restless around the 6 hour mark. So be patient, and ease your pup into it. We put up three baby gates to keep them from going upstairs, downstairs, or into the kitchen and we shut the doors to the bathroom and office. Eventually, we hope to open the office as the weather warms because that room is cooler than the main room in summer and Neva likes to nap in there in the afternoon. Good luck! Thank you so much for the tips! I’ll just have to be gradual. Will also probably set up one device to Facetime another so I can watch how my pup does at first!